photovoltaic system for low voltage direct current circuits. What is the difference between cable and wire - you have me on that one. To me, 2 gauge and larger is cable, 4 gauge and smaller is wire. For now we will call everything cable. This one-sided discussion is about Copper cable and wire. I do not believe that aluminum wire has a place in an alternative energy system. wound up in bundles then surrounded by an insulating sheath or jacket. The more strands in the cable, the more supple (flexible) it is. 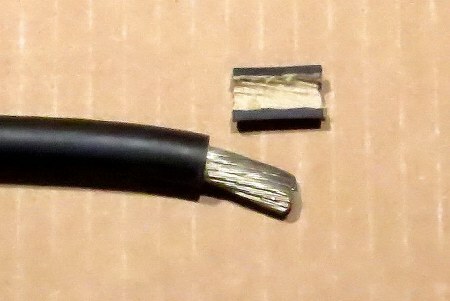 The more finely stranded cables make better connections, especially in low voltage applications. 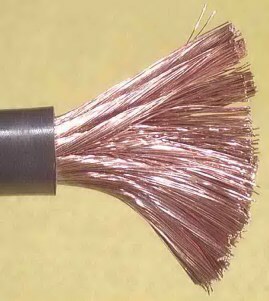 Stiff cable works fine in a house or building that is conventionally wired for 120 / 240 volts a.c. If you look under either the hood or dash of your vehicle - none of the wires or cables are very stiff. from the engine would be telegraphed to your battery post. How long would the post connection last? the cable or batteries heat up and cool down. 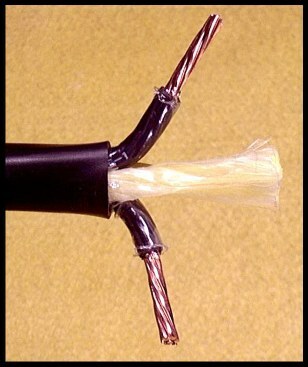 The finer the strands in your cable, the more intimate contact will be made at any of your connections. portable power cable, boat / marine cable, USE (underground service entrance) and tray cable. We will discuss the pros and cons of each. This is the wire you will find at your local home center or electrical supply house. For our application is it not a very good choice. It has large, but very few, strands and is not very flexible. Around batteries and inverters it is a poor choice - on a mobile application it can be a disaster. I tried it once and will not use it again for anything over 10 gauge. Let's move on to cable that makes sense in our systems. We have all seen battery cable, when you lift the hood of your car and scratch your head. to the petroleum products used by the engine. It is a pretty good choice for low voltage setups. power distribution panels, circuit breaker boxes and inverter housings. It is not rated for use in sunlight nor for direct burial. We have used it a lot in battery to battery connections. Welding cable is very fine stranded to make it supple for use by welders. tugging on the welding torch or stinger. It is ideal for alternative energy systems as long as it is kept out of the weather. 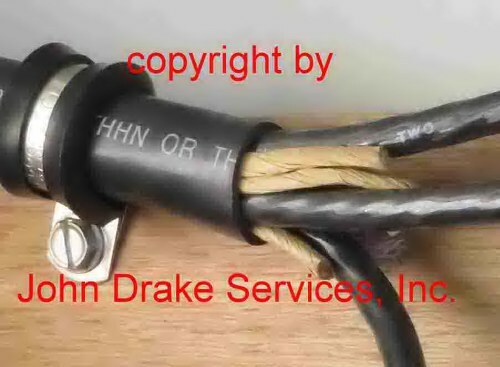 Most welding cable is not U.V. rated and the insulation will eventually break down in sunlight. The picture on the right shows bundles of very fine wires (strands). Years ago I got a deal on some 2 gauge portable power cable. I did not really know what it was but could not pass up the price. The piece shown above has the finest stranding I have ever seen. a very tough jacket - the thickness of the jacket layers is about 3/8". The information is not inked on the jacket, it is embossed into it. should not be used outdoors because of degradation in sunlight. I have used this in sizes up to 8 ga. for wiring charge controllers and running lighting circuits. One of the handiest cables available is tray cable. I have used tray cable in two, three and four conductor variations. One of our TriMetric battery monitors uses about seventy-five feet of 18/4 tray cable in an aerial run. 6 gauge / three conductor cable to the charge controller. The voltage drop is pretty much nil. You will notice on the left picture that all of the conductor insulation has the same color. wire is which from one end to the other. 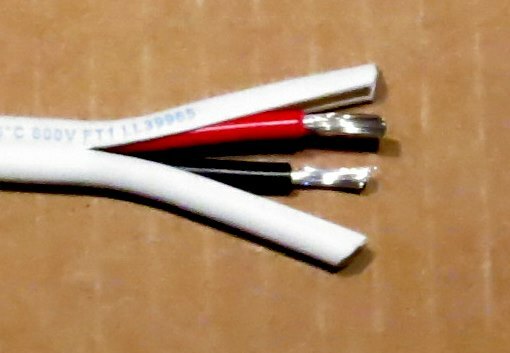 Tray cable can be found like this or with different insulation colors for each conductor. 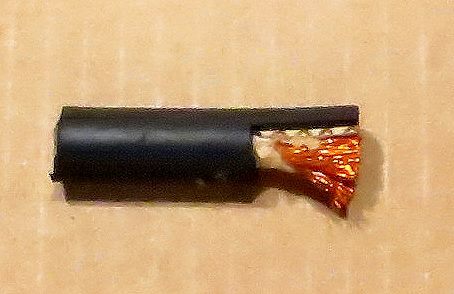 This is a single conductor wire with a heavy insulating jacket and is rated for direct burial. The "-2" indicates that the jacket has a high temperature "wet" rating. Most wires and cables used in direct burial or outdoor applications will have two temperature ratings. This can come into play when using them on roof tops panel interconnects. Temperature ratings of wire and cable insulation. Voltage ratings of wire and cable insulation.